We didn’t come all the way to Mallorca to miss out on the experience of eating a Paella cooked with fire. As soon as we got there, we booked a table at Sa Foradada! A recipe for paella is passed down from generation to generation. In addition to a recipe, the importance of inherited knowledge is crucial to making a good paella. This is the case for Lidia and her team at Sa Foradada. Passed on by her father 15 years ago, Lidia has continued their tradition of cooking paella at a restaurant located on the cliff tops of the west coast of Mallorca between Deia and Valldemossa. Only reachable by hiking (40 minutes to 1 hour depending how fast you walk) this is what you find…an open plan rustic kitchen adjoined to the natural stones found in this part of the Island. A flame burning continually as they cook pans and pans of paella for the constant arrival of customers coming to try this infamous Mallorcan paella. 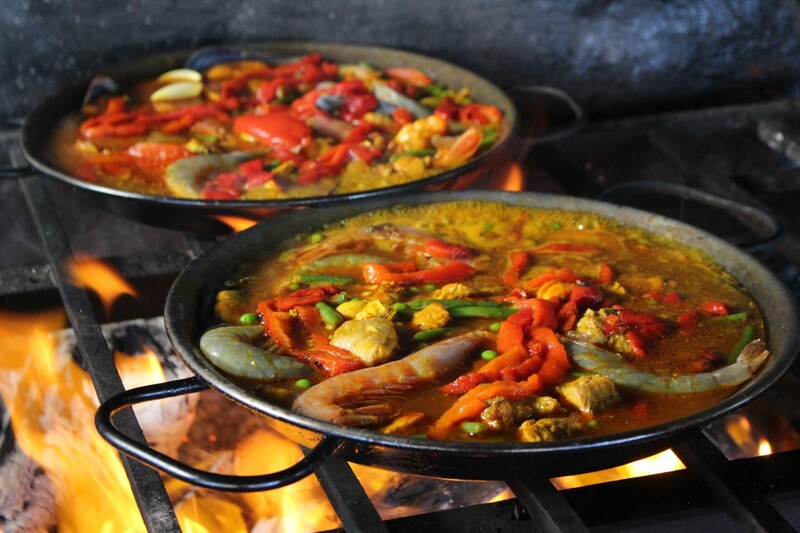 The paella they make is determined by what the region has to offer and that is predominantly a seafood paella, with the more recent addition of other options to meet customer needs. The secret ingredients they were willing to share with us were fire and love…but I swear the stock they had in a pot looked incredible and I think that definitely has some secret ingredients too (also prepared on the fire)!! Every ingredient in a Paella is important. From the water that you use, to the depth of the stock, the level of fat, the way the rice is cooked, and in their case, their main ingredient – the smoke…which provides a special aroma to the paella. The ability to control the heat and the paella pan when cooking over wood shows great skill and Lidia and her chefs do just that! Using their inherited knowledge to cook absolutely delicious pans of paella.